4 Metal Hooks for holding pen on ground firmly. Folds flat and comes with a free carry bag for easy transportation and storage when not in use. Panel Size: 39 x 39cm (Approx); Diameter: 93cm(36.7 inch) (Approx). Suitable for a variety of pets including puppies, dogs, cats, rabbits etc. Can be used both indoors and outdoors (For more details, pls see the Product Description below). Search CellDeal for more adorable choice. Made from durable 600D polyester with PVC coating. Lightweight, durable and portable, set up in seconds. Note:Due to safety concerns, please keep your pets away from chewing through materials. 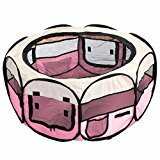 This entry was posted in Small Animals and tagged Cage, CellDeal, Fabric, Folding, GUINEA, pink, Play, Playpen, Puppy, RABBIT by One Boutique. Bookmark the permalink.